Labor Day 2014 finds me back in Lorain County, the home of Ohio’s largest annual festival (actually, it is always held in Lorain on the Sunday immediately preceding Labor Day) devoted to labor unions. After reading through Elyria’s Chronicle-Telegram and Lorain’s Morning Journal, I have felt the urge to respond to some of the political speechifying at Sunday’s Labor Fest (officially titled “20th annual Lorain County Organized Labor Day Family Celebration”) as reported by these two newspapers. As I have written before, I am a Republican who has run for public office who supports organized labor. I know many other Republicans, locally, who support organized labor even though local union leaders have often been antagonistic toward said Republicans. “You’re getting Republicans that have supported Mitt Romney, that are supporting John Kasich, that are supporting anti-labor, anti-women’s health, anti-voting rights agenda that national Republicans have.” Brown is supposedly talking about Republicans in elected office here, Lorain County, at the local level. Wait a minute . . . who the heck is he talking about? I can name names of anti-labor Republican office holders at the state level, but I’m scratching my head trying to think of who, possibly, Brown is talking about at the local level. For one thing, there are very few Republicans in office at the local level. The CT reporter, Evan Goodenow, indicated that Lorain County Commissioner Tom Williams–the sole Republican county commissioner–shook his head at Brown’s remarks. Evidently, if Brown was referring to Williams, then Brown was lying. Williams would be the expert on where Williams stands, not Brown. It stands to reason that Williams would not even have been in attendance if what Brown had said was absolutely true. Being there, and being visible there as a public figure, is a choice Williams made. He didn’t have to be there. That he chose to be there is evidence that Williams does not consider himself to be an enemy of the labor unions. Reportedly, Williams spoke personally with Brown after the speech and assured him that he supported labor. Brown said he didn’t know who Williams was. Brown must not have been referring to Williams. It is clear, by this revelation, Brown didn’t know what he was talking about. Brown was apparently just shooting his mouth off. Such reckless remarks and a clear disregard of the truth . . . umm, wait . . . no a total lack of concern for even educating oneself about the truth . . . do not inspire me with confidence in this person who holds the lofty position of U.S. Senator. State Rep. Dan Ramos urged voters to scrutinize candidates’ records. I wonder if Ramos supposes that such scrutiny would lead to the conclusion that every Republican is unworthy of support. Of course, those who are the most likely to avoid scrutiny are those who run unopposed. Ramos is running unopposed. Such a shame. We need to do something about that. Maybe I, myself, need to do something about that. But in a related CT story, I don’t have to wonder where local Democrat Party boss Anthony Giardini stands on who is worthy and unworthy of support. Whoever Giardini handpicks is worthy of support and no one else. Two members of Lorain City Council ran for election as independents, and that sticks in Giardini’s craw. Tim Carrion publicly revealed that, next year, he will challenge the Giardini-supported incumbent Democrat mayor of Lorain. Carrion has not firmly decided whether he will run as a Democrat or as an independent. Giardini, who would prefer that every Lorain officeholder be his pawn, strongly expressed that Carrion should mount his mayoral challenge within the Democrat primary. While expressing this, Giardini does not have an open mind about Carrion as a candidate, for he already backs the incumbent. With the party boss already choosing sides, why would Carrion feel it’s in his best interests to run in the primary as a Democrat rather than as an independent in the general election? Giardini offered that if Carrion beat the incumbent in the primary that he would support him in the general election. If Carrion chooses to challenge in the primary, then, purely statistically–like a coin toss–without taking any other factors into consideration, Carrion only has half a chance of advancing to the general election. As an independent, Carrion guarantees that he advances to the general election. As an independent, yes, Carrion would definitely not have Giardini’s blessing, whereas he has some chance of securing Giardini’s blessing if he won a Democrat primary, but is a primary contest really worth it when Giardini is clearly not going to remain neutral in the primary? If Giardini would vow strict neutrality in the primary, and not try to tip the scales, I think, if Carrion views Giardini as trustworthy, then running in the primary would make total sense. Absent that, Carrion should go independent all the way. I have to admit to some measure of delight that a couple of union-backed independent members of city council have ripped a page out of Giardini’s playbook of machine politics to beat a couple of Giardini’s handpicked candidates. Giardini’s Democrat political machine has always relied heavily on union members’ contributions to make it work, and those wins serve as reminders to political bosses to not take those key contributors for granted or turn them into pawns. The MJ story by Richard Payerchin offers some hope that local union leadership will be more open to forging alliances with Republicans sympathetic to worker interests. Jim Slone’s (Lorain County CAP Council of the UAW) declaration that he is a unionist before he is a Democrat doesn’t exactly translate into a willingness to ally with Republicans, but it seems to leave the door open to that. Similarly, Harry Williamson’s (Lorain County AFL-CIO) observation that, “I’ve emphasized that specifically here in Lorain County, history’s always shown that labor has been a D-type (Democratic) organization. As workers, we have to get away from that mindset,” is even more encouraging since it was coupled by an example of an actual former Republican officeholder that was a friend to labor. Keith Hocevar’s (Bricklayers and Allied Craftworkers Local 16) assurance that, “In the building trades, we talk to both sides; we talk to Democrats and Republicans in races. For us, we look at individual races and talk to the candidates and talk to the candidates who support our issues,” is the most comforting. I hope that Dan Ramos and Sherrod Brown carefully read those statements, as they paint the GOP with such broad brushes as to suggest Republicans are monolithic in their political views. They should campaign on their own virtues vis-a-vis the candidates they face. Voters need to know that while some candidates are willing to be party pawns, others are too principled to allow themselves to be treated as pawns. It is the voters’ responsibility to determine which is which, and when they find a principled candidate, it behooves voters to demand to know just what those principles are before they cast their votes. I have always maintained that one should vote for the person, not the party. Voting for a party slate assembled by political insiders is why nations governed by parliaments are inferior to the elections conducted within America’s system of government. In both the CT and MJ articles, John Kasich was held up as an object of scorn. In closing, let me offer this head’s up. When it comes to opposition to unions, John Kasich is nothing compared to Jon Husted. I sure hope Husted is not the “anointed” GOP candidate for Ohio Governor in 2018. If he is, I sure hope he is vigorously contested in the GOP primary. Husted is a prime example of pay-to-play politics. I would not cast a vote for Husted even if he ran unopposed, whether in a primary or in a general election. It has been a long time since I last checked the links on my blogroll. I have made changes. Deletions from the blogroll were based on links that stopped working, links that redirected to a totally unrelated page, blogs that were blank, blogs that were password protected, or blogs that hadn’t added content in years. If you own a website that was deleted and you would like it reinstated, you should probably include an explanation of why I found what I found when I clicked on your link. If for example, your link was dead because you changed your URL, then I’d be happy to revisit my decision to delete. After those deletions, I am looking to add to the blogroll. I will be on the lookout for blogs that are Ohio-based and/or politics-based. North central Ohio, like the counties along the Lake Erie shoreline between Cleveland and Toledo and a little further inland, is what I consider my home territory, for I have resided in Erie, Seneca, and Lorain counties (Franklin County, too, but plenty of blogs cover Columbus). Huron, Sandusky, and Ottawa counties are of interest, too. If you would like your blog added to my blogroll, give me a holler (my profile with email appears on the About page). As you know, I identify myself politically as being right-of-center (even though there are those who disbelieve my self-assessment). On another note, I was stunned to see that WordPress had begun to place ads on my site. I paid WordPress extra money just to keep my blog advertisement-free. If you see ads crop up on Buckeye RINO, I’d appreciate it if you would let me know so that I can investigate. For social networking, I have been using just Twitter, as I find it least annoying among social networking sites. I once had Facebook and a few others, but I hated them, so I pulled the plug on them. However, if readers have a social networking site that they want to recommend, let me know, and if you really think I should return to Facebook, I will entertain your arguments (but make them good, since I’ll be difficult to persuade). There is an alternative weekly paper in Columbus, called The Other Paper, who has a managing editor named Dan Williamson. He sometimes writes articles that include political figures and political issues. I’m also known as Dan Williamson. My first media exposure in a political vein occurred when I was a Republican candidate running for state representative against incumbent Democrat Joe Koziura, of Lorain, in Ohio’s 56th House District in 2002. I listed my name on the ballot as Daniel Jack Williamson for two reasons, one reason being that my dad, Jack Williamson of rural Bellevue in Seneca County, was a candidate in the Republican primary for an open seat in the 58th House District, which neighbors the 56th, and I thought where media coverage about those two state rep races overlaps, my middle name on the ballot might somehow improve his name recognition. I wrote letters to the editors of newspapers, and I posted comments at an online community forum at LorainCounty.com, but that was just about the greatest extent of my writing contributions to the media at that time. 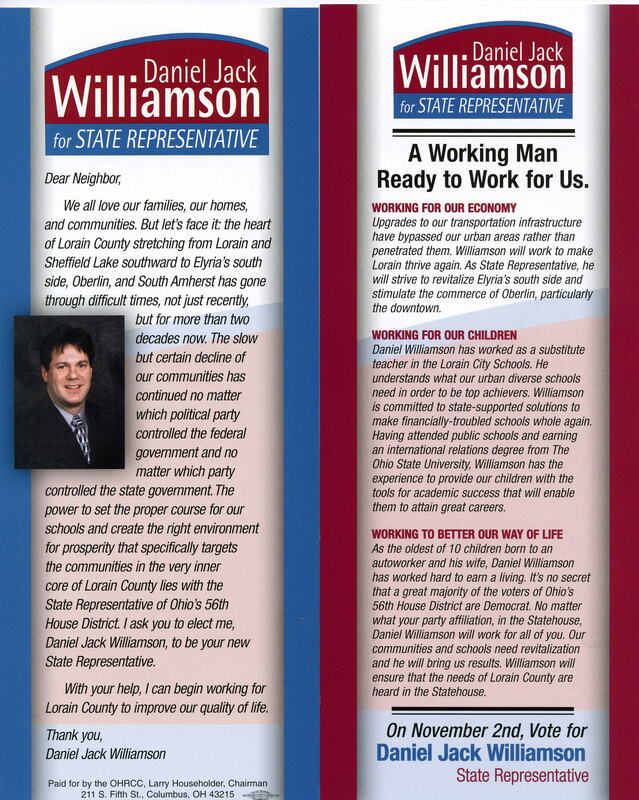 I ran again for state rep in 2004 (an image of my 2004 campaign literature here–you’ll have to scroll to see the whole image). My political writing had not expanded beyond what it had been during the 2002 campaign. 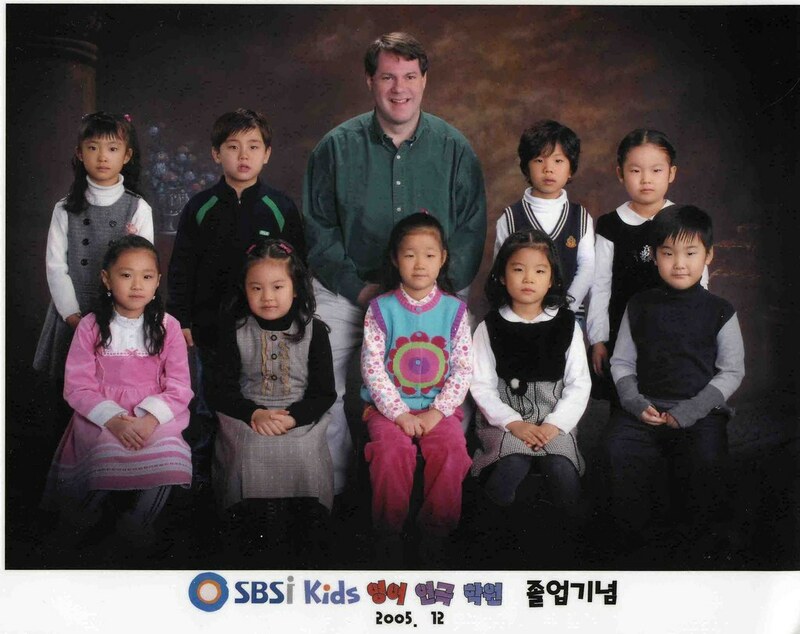 In early 2005, not long after losing (again) the election in November 2004, I went to South Korea to teach English for a year (image), so I wasn’t even posting online comments at Lorain County.com during that time. In early 2006, I was back to posting online, but my comments, critical of Sherrod Brown before Paul Hackett withdrew from the Democrat primary for the U.S. Senate seat, kept getting deleted by the website, and after that, my comments went to moderation, and it would be about 24 hours before my comment would actually appear. By then, the conversation thread had lengthened quite a bit, so my comments weren’t likely to be read when they did appear. That’s when I started looking to other blogs to comment. In 2007, I began contributing entries to blogs. In the early 1990’s, I was living in Columbus. The Other Paper had emerged on the Columbus print media scene. Dan Williamson became a known byline. Most of my friends and co-workers called me Dan. I didn’t realize that some of them were confusing me with the journalist until the secretary of my boss at National City Bank (where I worked from September 1993 through May 1995 as a teller) gave me a compliment about my writing. LOL! I quickly corrected her and said that it wasn’t me. Until I moved out of Columbus at the very start of January 2000, I’d had a number of people approaching me similarly, and these were people who knew me quite well, some of whom I saw nearly every day! So, the second reason I chose to include my middle name on the ballot? Because I already knew that people had been confusing me with the journalist for years, and that if I received media coverage as a candidate, I hoped that including my middle name would spare media observers the confusion. I continued using that middle name when I made my first foray into blogging for much the same reason. But I suppose that once I start generating political commentary, and, in a sense, entering the arena that the journalist was already in, I suppose it was inevitable that the confusion would arise anyway. And so I guess writing this blog entry to set the record straight was inevitable.